Firenze (sometime home to Galileo Galilei ) is Emerald Chronometer's orrery . Its front side shows a heliocentric view of the solar system (as it was known in Galileo's day, with only 6 planets) plus the Earth's Moon. The view is from far above the Sun's north pole; the planets move counter-clockwise as time moves forwards. Only the angular positions of the planets are represented; the relative distances and sizes are wildly out of scale (as they must be in a practical sized display: If Saturn's orbit was shown at the same scale as the Earth's the watch would have to be about 5x larger than it is. If the Sun image was shown at the same scale as the Earth it would be almost 5x larger than the whole screen. If the Earth-Sun distance was shown at the same scale is the Earth image it would be more 10,000x larger than the whole screen!). In Set mode, you can drag the planets. The two pushers advance by an hour and by a lunar month. You can also drag the hands and tap the windows as usual. Tapping the year window advances by exactly the period of the Earth's orbit, not a calendar year. 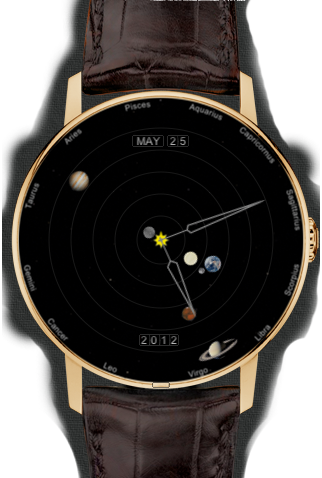 The back is a more down-to-Earth view of the solar system. 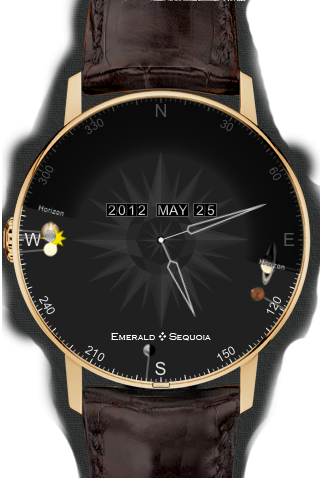 The outer perimeter of the watch is marked with compass directions and each planet (now including the Sun but not the Earth) is shown according to where it is in the sky at the watch's time and Emerald Chronometer's current location. The planets' altitudes are not shown. Half of the perimeter is covered by a partially transparent moving mask which indicates the points at which the ecliptic intersects the horizon. Planets behind the mask are currently below the horizon. You can't drag the planets in Set mode on the back but the usual controls are available. The pushers are the same as the front. Notice how the planets' apparent motions seem to speed up and slow down as they approach the horizon; this is correct (the relatively simple geometric explanation is left as an exercise for the reader). Note also that this effect is more radical at low latitudes.